The 2018 Ghana Premier League season was officially launched at the premises of the Ghana Football Association on Monday. The event finally came off after the second take following an application of an injunction by Great Olympics that held up the start of the league season. Olympics’ application for the injunction was subsequently thrown out by a High Court and that allowed all activities concerning the league to go on as planned. The launch was attended by the chairman of the Premier League Board, Ashford Tettey Oku, members of the Ghana Football Association, representatives of StarTimes and Nasco, who both sponsors of the league, and representatives of some Ghana Premier League clubs. A new logo for the Ghana Premier League was unveiled and the 16 clubs who will be in the league also unveiled the kits they would be using for the season. In addition, Nasco announced an upgrade of the prizes handed out for coach and player of the month. Last season, Nasco mobile phones were handed out to excelling players and coaches on match days and across months. The new season will see players win Nasco Magic mobile phones and electronic shaving machines on match days. 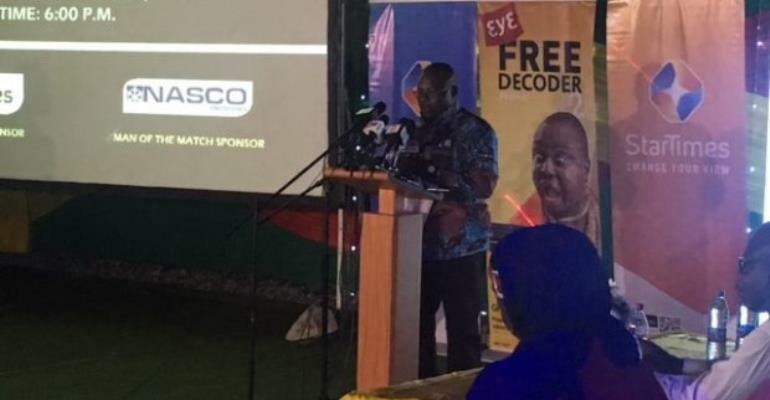 Monthly winners will now take away Nasco television sets. Players will get a 32-inch Nasco television and trophy with their names on them. Coaches will get a 40-inch Nasco television and trophy with their names on them. The Ghana Premier League season is expected to start on the weekend of March 2-4, 2018.